Please note that Cifonda threads are now out of production. While we have an extensive range of stock of this product we can no longer guarantee availability of every colour. 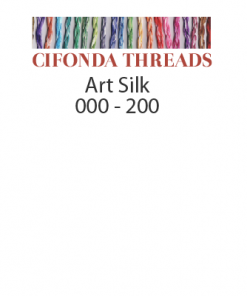 Cifonda Threads are a composite silk thread with the sheen of silk and the vibrant colours of rayon. They are made of 35% silk, 65% rayon as a 6-stranded, 2-ply floss with a high gloss. 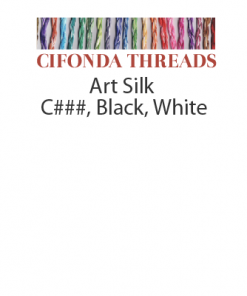 Cifonda threads are ideal for thread painting, highlighting, and wherever the look of satin is desired. Cifonda embroidery floss is designed for the surface embroiderer wanting a very fine thread for detail work. It is easy to manage. To obtain the best results, Cifonda recommend to hold the thread taut above and below the work surface while stitching and to use a size 12 sharps needle. The manufacturer recommends that you soak the thread to remove any excess dye before use. Cifonda threads are very similar to Rajmahal Art Silk and are a complementary colour range to those threads.